What: ‘Thunderclap’ is a steganographic zine, that piggybacks on fashion accessories to publicly distribute the erased writings of Chinese anarcho-feminist, He-Yin Zhen (1886-1920). Steganography as form of secret writing, is the art and science of disguising hidden information within public information. At the centre of this practice is the instrumentalisation of the innocent to reach new audiences and evade surveillance, censorship and control. Fashion is generally regarded as ‘toothless’ or ‘politically harmless’. Can this apparent innocence be instrumentalised as a cover to spread alternative knowledge? 'Thunderclap' attempts to answer this provocation by steganographically distributing the work of He-Yin Zhen (1886-1920? ), — a theorist who figured centrally in the birth of Chinese feminism — on fashion accessories such as patches and ribbons. These accessories contain English quotes of He-Yin Zhen essays nested around a QR code that when scanned, downloads her original Chinese writing. Because her writings were considered radical and dangerous in her lifetime, they have been gradually erased from the historical record in China. He-Yin Zhen’s writings remind us that feminism is not only a contemporary Western movement but also one that was articulated in imperial China. As such, Thunderclap aims to reinsert He-Yin Zhen's writing back into Chinese history and public knowledge in the context of China. Central to the ‘Thunderclap’ project is the idea of instrumentalisation, the practice of using one thing to achieve another. Firstly, by utilising the medium of fashion as a ‘walking zine’ – an alternative and self-published medium that is simultaneously intimate (private) and distributed to the masses (public). Secondly, by taking advantage of decorations’ mass appeal as a covert vehicle to spread forgotten knowledge. A current Chinese fashion trend is to use English text on clothes. These texts however are not designed to be read, but rather function as an ornamental and symbolic value signifier. The aesthetics of Western culture is expressed through the Roman alphabet which literally embodies ‘high culture’ and ‘edginess’. Thunderclap takes advantage of English-as-decoration because it also serves as an information lubricant and ‘scanbait’, whilst the popularity of this trend helps to further distribution and circulation. In China, the QR code is also hugely popular thanks to the QR code scanner built into 'WeChat', the nation’s most widely used app. It is so ubiquitous and omnipresent that even street vendors and beggars use QR codes as modes of transaction. In light of this, the pervasive visual presence of QR codes inadvertently provide an inconspicuous disguise to distribute the work of He-Yin Zhen. And thirdly, the weaponising of decoration as a safety measure for people that distribute her words on their bodies. The choice to use English instead of Chinese also acts to mask statements that may otherwise attract unwanted violence. In this way, the work negotiates and balances visibility and invisibility, exclusion and inclusion, online and offline, subversion and innocence. For the final event, I turned my studio into a DIY sewing space and shop. Visitors could customise their own clothes with ‘Thunderclap’ patches & ribbons and transform themselves into walking steganographic fashion zines. Sales of ribbons and patches are available from I:projectspace’s wechat shop within China. For sales outside China, please contact me. 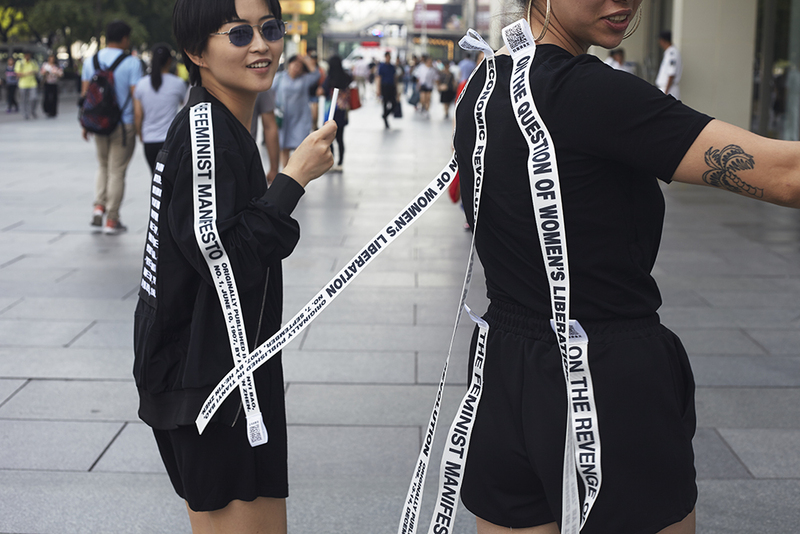 Thunderclap is the first manifestation of the larger body of research called ‘The New Nüshu’ that investigates Chinese feminism, language politics, steganography and publishing in the context of China.